With this third album, the norvegian band reinveted themselves with a more atmospheric sound, turning from doom metal into a more gothic rock oriented approach. Harsh male vocals are less frequently used, giving space for clean deep vocals. Heavy guitar riffs also leave room for delicate twelve-strings guitar melodies, as frequently heard in gothic bands. Also, piano and strings tend to turn into hypnotizing floating keyboards layers and heavenly sounds. 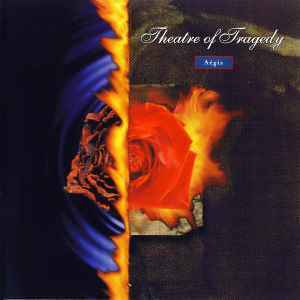 Not trying to copy cult 4AD 80's indie dark bands like This Mortal Coil, Clan of Xymox, Dead can Dance, Cocteau Twins and so on, although their influence can be heard on this album, Theatre of Tragedy recreated a sound of their own with Aégis that sounds like nothing else than itself. The result is a collection of songs wrapped with captivating melancholy where the beautiful voice of Liv Kristine appears more versatile and confident than before but still astonishingly beautiful, spontaneous and innocent. To me, Aégis is their most beautiful album and their greatest artistic achievement.